The London Cycling Campaign is calling on government and the private sector to do everything in their power to make direct vision lorries the only type of lorry in urban streets. 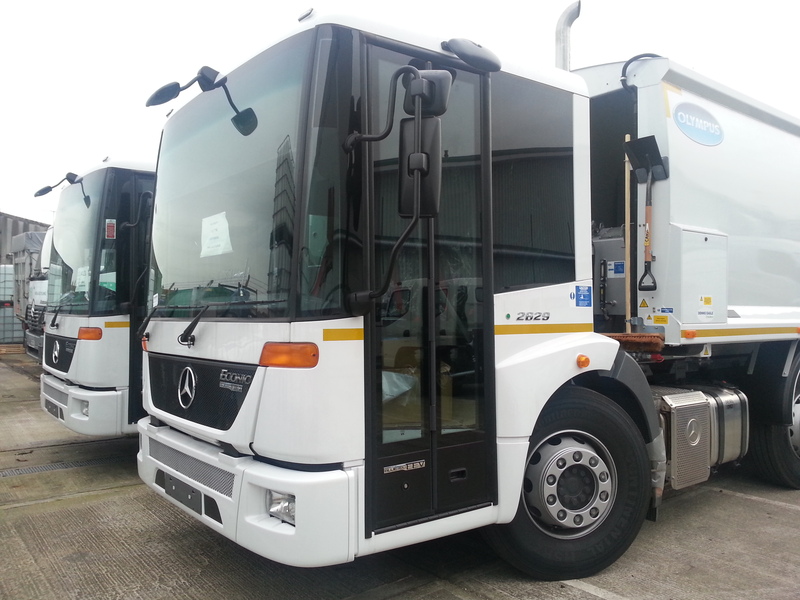 These lorries - such as the Mercedes Econic model (pictured above) - have a lower driving position, and large glass areas to the front and side that give the driver a direct view of pedestrians and cyclists in close proximity to their vehicle. Our renewed call for safer lorries comes in the wake of the inquest into the death of Dr Katharine Giles, a respected climate scientist who was hit by a left-turning lorry in Victoria Street in April 2013. CCTV footage shown at the inquest showed that Dr Giles cycled alongside the lorry as it was turning left from Palace Street into Victoria Street. The design of the lorry meant the driver had no direct view of the area in which Dr Jenkins was cycling, and was unaware when he turned left across her, causing fatal injuries. LCC's Mike Cavenett said, "Government and the private sector should be working toward making 'direct vision' lorries the standard in urban areas where millions of vulnerable people walk and cycle every day, and where lorry-related fatalities happen all too often. "If the driver involved in this fatality had been driving a direct vision lorry, then he would have been able to see Dr Giles, and she would most likely be alive today - yet there's no programme of regulation or incentives to introduce these lorries." A Mercedes Econic 'direct vision' lorry took part in a mayoral cycling promotion event outside City Hall in December (see photo below taken inside the cab). Dennis Eagle also manufactures a direct vision lorry, the Dennis Eagle Elite 2, which is used frequently as a refuse truck on London's streets. In 2013, LCC produced a graphic of a Safer Urban Lorry, which married a direct vision cab to a tipper truck chassis - similar to the lorry shown outside City Hall (see final pic below). Direct vision cabs have been built into tipper trucks, refuse lorries, fire engines, articulated lorries, and most other forms of commercial vehicle. LCC is also calling for a lorry ban during the morning rush hour, and for all urban lorry drivers to benefit from on-bike cycilst-awareness training. We've also published extensive information as to how people on bikes can best avoid danger when cycling near lorries.